"Denial is a powerful tool. Never underestimate its ability to cloud your vision." Filed under: Advice from your Uncle Jim,Criticism, Marginalia, and Notes,Life Goals,News and Current Events,Red Herrings — Posted by the Network Geek during the Hour of the Tiger which is terribly early in the morning or 5:06 am for you boring, normal people. Funny thing. Yes, as it turns out, it does. And, now it’s been mostly proved by science. Comments Off on Does exercise really make you healthier? Filed under: By Bread Alone,Deep Thoughts,Life, the Universe, and Everything,Personal — Posted by the Network Geek during the Hour of the Tiger which is terribly early in the morning or 5:26 am for you boring, normal people. This is probably not a big deal to anyone else but me, but, well, I’ve gotten a juicer and started juicing. Now, this does not mean that I’m using steroids, which is what I think of when I hear “juicing”. No, this is actual juice, made from fruits and vegetables. Mostly, though, vegetables. I don’t eat very well. I admit it. I don’t get the daily recommended amount of fruits and vegetables and I eat far, far too much meat. I know this. I know this is why I tend to be so heavy, why my blood pressure is as higher than it should be, why I feel older than I should. I know I should eat better and be healthier to help keep cancer from coming back. So, I’m making a compromise. 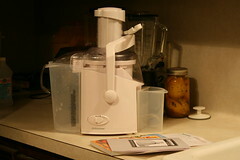 When I was near the end of chemo, it seemed like every cancer survivor I ran into asked me if I’d gotten my juicer yet. I’d meant to get one of those years ago, I would tell them. And, I’ll have to get around to that one of these days really soon, I’d add. But, more than a year after finishing chemo, I still hadn’t done it. No, it took my own vanity to push me to go get one, any one, to try. See, I need to keep my nutrition levels as high as possible, while keeping my calorie intake as low as possible and juice seems like the way to do it. It is, in fact, a Juiceman Junior brand juicer, named after the original juice advocate. Though, sadly, he can no longer call himself the “Juiceman” due to contractual obligations. Still, he was the one everyone remembers from the late night ads and the Jim Carrey skit on In Living Color. I thought it would make me all crazy, like everyone who was on those ads seemed to be, to me. But, it hasn’t made me any crazier than I already am. And, you know what? I’ve been enjoying the juice! Yeah, who would have thought it? I like taking apples and carrots and celery and spinach and parsley and ginger and sweet peppers and juicing them all together. It’s pretty amazing. Oh, sure, at first glance it looks disturbingly green and I was sure it would taste terrible, but, really, it doesn’t. In fact, it tastes sort of good. And, now, I’m getting into a rhythm of making enough juice for two or three days at a time, so it’s actually getting easier to do! It’s sort of a pain to clean the machine, but, so far, I like the results, so it’s worth the work. I don’t think I’ve lost any weight yet, but I do feel better already. So, yeah, as strange as it seems, I’ve become one of those crazy juice people. And I don’t even mind! Filed under: Advice from your Uncle Jim,Criticism, Marginalia, and Notes,Life, the Universe, and Everything,News and Current Events,Personal — Posted by the Network Geek during the Hour of the Tiger which is terribly early in the morning or 5:17 am for you boring, normal people. Well, the doctor told me that I’m still alive yesterday! So, yesterday I got the results from my scan last week. Everything was good. Well, mostly. I mean, my blood pressure was low enough to surprise the aid, which is good considering they were concerned that I was going to blow a gasket when I first started going to M. D. Anderson. I mean, my blood pressure was almost twice then what it was today. Literally. They thought I was going to stroke out before they could start chemotherapy treatments. Now, with medication, it’s on the lower side of normal. And, my blood counts were all pretty normal. I’m still a little on the anemic side, but even that wasn’t worth mentioning. She was a little concerned about my weight, but, then, I know it’s a bit of a problem. So, I need to get my bike back into shape and start riding. In spite of what some people may think, I have been working out at least three times a week for a couple months. But, dumb bells and hitting the heavy bag just isn’t taking the weight off. I feel better than I have in two years, but, then again, considering that I was basically a walking corpse at one point there, that’s not saying much. Oh, and I need to get a juicer like I’ve been meaning to for months. Several cancer survivors I know or have met all swear by theirs, so, I figure I might as well get a less expensive one and see how I like it. What can it hurt, right?